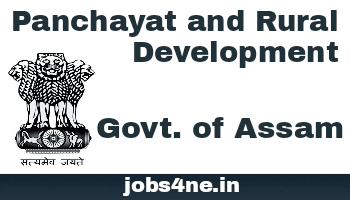 Panchayat and Rural Development, Assam Recruitment for 3,787 Nos. Various Posts: Last Date Extended. - Jobs4NE : Jobs in Assam and North East India. Panchayat and Rural Development, Assam Recruitment for 3,787 Nos. Various Posts: Last Date Extended. Applications are invited from eligible Indian citizens in prescribed form for filling up the following positions on Contractual basis under Mahatma Gandhi National Rural Employment Guarantee Act (MGNREGA) and Pradhan Mantri Awas Yojana (Gramin) under the Department of Panchayat and Rural Development, Assam. Last date for submission of the online application: 31-08-2017. 20-09-2017. Total no. of Post: 3787 Nos. 1. Accredited Engineer: 1850 Nos. 2. Gram Rozgar Sahayak: 520 Nos. 3. Computer Assistant: 60 Nos. 4. Account Assistant: 46 Nos. 5. District MIS Manager (MGNREGA): 9 Nos. 6. Gaon Panchayat Coordinator: 1083 Nos. 7. Block MIS Manager (PMAY-G): 219 Nos. Qualification: Diploma in Civil Engineering may be given preference. Qualification: HSSLC Passed. Candidates from Science & Commerce stream may be given preference. Qualification: HSSLC Passed and processing basic computer & Internet skills. Qualification: HSSLC Passed under Commerce Stream. Qualification: MCA/ BCA and experience in the related field is desirable. Qualification: BCA/ BCIT/ PGDCA with 1 year experience. How to Apply: Eligible and interested candidates may apply online through official website www.rural.assam.gov.in or www.pnrdjobs.in. For application format, applicants are advised to visit the mentioned website. Tags: 12th Standard, Assam, Graduate, Post Graduate, State Govt.